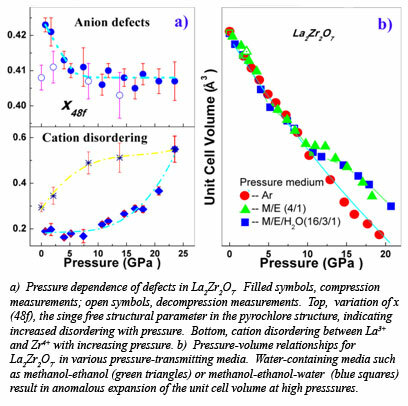 Researchers from the group of CDAC Academic Partner Rod Ewing at the University of Michigan and collaborators from the Geophysical Laboratory have demonstrated a new method to detect and quantitatively measure pressure-induced atomic disordering in pyrochlore oxides. This discovery provides new insight on the formation of of defects at extreme conditions and reveals a possible mechanism for photochemical reactions in these oxides. Pressure-induced structural disordering, such as the substitution of elements or the formation of vacancies and other defects, is very common and is important to earth and material sciences. However, quantitative analysis of disordering at high pressure at the atomic scale is a very challenging problem from technical standpoint. In the particular case of pyrochlore oxides, cations and anions will form antisite defects and Frenkel pairs simultaneously at extreme conditions. With x-ray diffraction data collected on the pyrochlore oxide La2Zr2O7, at Beamline X17C at the NSLS, the group has shown that defects originating from the cation and anion sites in the pyrochlore structure have different influences on the individual diffraction peaks and their contribution can be quantitatively distinguished in the x-ray diffraction pattern. Using the Rietveld refinement method, it was concluded that anion defects formed below 5 GPa and cation antisite defects dominated above 10 GPa (Fig. a). An anomalous lattice expansion was confirmed in the oxide at 10 GPa by x-ray diffraction, Raman scattering and synchrotron infrared absorption conducted at the NSLS-U2A, if a water-containing pressure medium is used (Fig. b). Water intercalation in pyrochlore oxides may be common during the process of either pressurization or ion irradiation, and it is mainly due to the formation of cationic defects. Some pyrochlore oxides, such as La2Zr2O7, have been used previously as catalysts for the photochemical splitting of water, a process that may be closely related to the formation of defects in the pyrochlore structue [Zhang et al., Phys. Rev. Lett., 105, 015503 (2010)].